The first film of the festival looked like an undiscovered gem from the 1960s. It's in black and white, shot largely in close-up, handheld, and on the go. It even pits, surely as some documentary from generation vérité must have, an idealistic "free school" principal against an unbound, anarchic army of longhaired adolescents. Though recorded in 2008, it's constructed less as an overtly political work than one of immersive experience, and evokes fictional dystopias such as Lord of the Flies. as much as it does Pennebaker or Maysles docs. The second film of the festival started in super-stylized slow motion, with the super-saturated red of a housedress popping and pixilating, and a voiceover confessional-"I break things," we're told-baiting us to distrust, perhaps even dislike the woman who's to be our protagonist. Yet what starts as an experiment in documented performance-a trained actress cast as the star of a documentary about her now domesticated life-also becomes as frank a portrait of marital dissolution, and of the damned-if-you-do, damned-if-you-don't tensions between motherhood and careerism, as you're likely to see in a movie, be it documented or scripted. And then the third film of the festival was a buddy comedy that became a critique of humanitarianism that became a subtle defense of humanitarianism that became a kind of who's-zooming-who psychological shell game that became an elegy for the children of the Rwandan genocide, and all of it was shot like a dream and added up to some kind of stunt masterpiece. Then it was midnight. After which we drank beer from a keg in a dangerously crowded basement and strained to talk about Approaching the Elephant, Actress, and Life After Death—three of the best films I'll see all year—while an overeager French klezmer band blared and clanged and stripped to their suspenders and pantaloons. Welcome to True/False. By now, the cat's pretty well out of the bag. The True/False Film Fest, the little doc survey that takes place in Columbia, Missouri, every late winter, is among the best programs on the continent. The indie film community is no longer divided between those who've heard or not heard of it, but between those who've drunk the Kool-Aid and those who've had small-town-gone-ga-ga-over-documentary testimonies pushed on them like an elixir. The top documentarians and programmers and funders from around the world now routinely trek to Columbia, where they're joined by a multiplying contingent of film critics, sharing in the spoils of adventurous programming and campus-town culture (the University of Missouri abuts most festival venues, and harbors the largest theater) while struggling-productively, I think-to balance critical discernment with collegiality. For True/False is rather explicitly about the blurring of lines-between documentary and narrative film, between local and international communities, and yes, between art and criticism. It's virtually impossible for filmmakers and critics to avoid interacting during the fest, let alone having those interactions spill into drinks at the Broadway Brewery, or a shared pie at Shakespeare's Pizza, or a crowd-the-mike singalong at a local karaoke bar, or a desperate search for a cab at 4 a.m. in one-degree cold after emerging from that basement party in nowheresville. This may not be the plan of True/False, but it's certainly the idea. After all, this is an organization that has taken to commissioning the expertise of critics at a festival they're also covering. Last year was the first iteration of Neither/Nor, an annual, critic-led survey of the historical lineage behind the kinds of films that True/False likes to celebrate (though not exclusively): doc-fiction hybrids, i.e. uncategorizable experimentations, i.e. "chimeric cinema"-their chosen term. I was brought in for the inaugural survey, programming four whatsits from late-sixties New York, and preparing an accompanying monograph of essays and interviews, while this year Godfrey Cheshire chose four films from the rich store of Iranian chimeras, including Abbas Kiarostami's landmark mind- and ethics-bender, Close-Up. Funding from AMPAS ensures that the program will continue for the foreseeable future, matching critics with different national movements and boundary-blurring moments in time. The blurring of such lines can either challenge or compromise. Explicit hybridization can serve as little more than a cover for wanting art. And weak programming paired with a critic grateful for the fest-funded vacation, will foster defanged, and ultimately useless coverage. But when the art is worthy, or intriguing, or unpredictable, hybridized elements can push each other to unforeseen places, elevating discussion beyond the work or moment at hand, yielding new ways of thinking, seeing, being. Now in its 11th year, True/False has pushed this idea with so much conviction that it's worth considering if the fest has helped to define the current state of the art. Considering the dwindling theatrical market for documentaries, it's hard to overestimate how important it is for a formally frisky filmmaker to be celebrated at a fest like True/False, to have his or her odd ducklings prized by and puzzled over by packed houses of doc-smart Midwesterners? Co-directors Paul Sturtz and David Wilson took things a crucial step further this year by making True/False the first major fest in the country to pay filmmakers for the privilege of screening their films, calling it "a tangible way to invest in filmmakers doing great films over the long haul." (This on the heels of a longstanding partnership with Columbia's The Crossing church that provides funding to select documentary subjects-talk about blurred lines.) Would Robert Greene (Actress), who's premiered his last three films at True/False, or Jessica Oreck (The Vanquishing of the Witch Baba Yaga) or Amanda Rose Wilder (Approaching the Elephant) or Joe Callander (Life After Death)-all of whom launched their latest features at T/F 2014-feel as emboldened to make movies as confidently and defiantly singular as they have, if it weren't for the "documentaries as art" culture that True/False has helped to foster? I ask not to promote, glorify, or mythologize the fest, but to get at how concrete support for something as ineffable as culture can build a bedrock for all manner of constructions. Draw a line around things and you'll be left with variations on those things; smudge the line-between genres, between institutions, people professions-and you also invite unpredictability, volatility, rich messiness, and newness. All of which applies to Life After Death, which is as impossible to pin down as it is to stop talking about. Though it's a first feature, the film was among the more anticipated premieres thanks to Callander's uproariously deadpan two-minute short Tina Delivers a Goat, which screened at last year's fest, and a three-minute follow-up, Tim and Susan Have Matching Handguns, which was cheekily acquired by Oscilloscope Pictures before premiering at Sundance in January. The wry absurdism of those shorts reemerges in Life After Death, especially in sequences in which best bros Kwasa and Fils puff out their chests with hapless brio, bumbling at kung fu, botching a chicken slaughter, and failing at innumerable day jobs in Kigali, their Rwandan village. Yet it becomes increasingly difficult to laugh at Kwasa, who proves to be as shifty as he is self-sabotaging. It's also increasingly difficult to laugh off his relationships with two sets of Christian American "parents," who not only send money but visit him in Rwanda to offer emotional and spiritual support. Intimations of religious imperialism quickly competes with more complicated disclosures of well-meaning people being played for fools (Kwasa drinks and carouses despite assurances that he's living the Christian life), and of those well-meaning people proving less foolish (they know very well that Kwasa's a schemer), and thus proving even more well meaning than they seemed. Over the course of the weekend, several viewers admitted that they were disturbed to find out that the film was produced by two of its American subjects, Suzette and Dave. Though it's certainly a notable arrangement, which warrants a story in its own right, the truth is that Callander doesn't depict them in a haloed light, nor does the film serve as an endorsement in any way of their personal beliefs or convictions-thus the shock at those producing credits at film's end. (Equally shocking, to me at least, was the brevity of the credits: Callander, who during the post-screening Q&A;said that he was given complete control over the final cut, captured all of the stunning sounds and pictures solo.) If anything, the disclosure only underscores the audacity of Callander's project, and of the impossibility of seeing the lives of his subjects as anything short of hopelessly, gloriously complex. It's a film that beseeches the viewer to laugh, hard and repeatedly, without obscuring the tragedies that lurk beneath the laughter, and which enriches over time into empathy, longing, and affection. 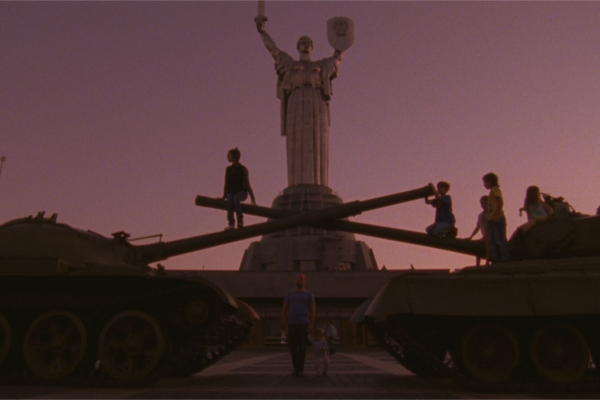 Equally audacious but in a very different register, The Vanquishing of the Witch Baba Yaga sees another American filmmaker, Jessica Oreck, training a camera on overseas subjects, in this case the people and environments of post-communist Eastern Europe. Whereas Callander's film strives to develop and capture moments of intimacy, suspect though they may be, Oreck's maintains a very studied distance. While some films can be described as impressionistic, hers can fairly be called a work of impressionism, such that the art of the image-its texture, framing, fracturing-is ever as crucial as the object of the image. And lordy, what images. Sean Price Williams, whose camerawork has been a highlight of Oreck's Beetle Queen Conquers Tokyo, Robert Greene's Kati With an I and Fake It So Real, and Alex Ross Perry's The Color Wheel and Listen Up Philip, outdoes himself here; from coppery sunsets and ground-level ambles through brambles to an endless and sensuous documentation of the application of makeup war-paint, pretty much every shot is a print it, frame it, prize it stunner. There's something touristic, even parasitic about this-there are lots of shots of sad, hollowed-out eyes, of hollowed-out buildings and emptied streets, of modernity grafted, ugly/beautiful-like, onto agrarian landscapes, and of arboreal conquests of abandoned, de-peopled industrial spaces, often scored to ambient music and pointedly without dialogue-but I mean to define, not damn. From an opening card that reads "Sometime after the 20th Century"-recalling the "Somewhere in the 20th Century" card of Terry Gilliam's Brazil-to Stalker-like tramps through otherwordly wastelands, Oreck is situating her alien eyes within the realms of science fiction, metaphysics, and fairy tale. Pace the title, the film's organizing device isn't narrative or even geographically based, but an episodic telling of the Baba Yaga fable, which is vividly realized using still drawings and voiceover narration, and introduces/motivates each cluster of documentary footage. The story-and the film that grows out of it-is one of transgression, of fear and loss and nostalgia and timelessness, of the unknowability of even what's directly before us, and thus also of constant discovery. It's a lot to take in at a festival setting, and I look forward to revisiting when I have more time and energy to get lost within it. I'm going to abstain from saying more than I already have about a film I greatly admire, Actress, given that Robert Greene is a friend. But in the blurred-line spirit of True/False, I'll at least invoke the words of my colleague Adam Nayman, who Tweeted after the latter's premiere, "You can feel this movie thinking." I think that's always the case with Robert's work, which is constantly challenging his subjects, challenging his footage and audience, engaging with the past and future of the form, and thinking and feeling in real time. Such privileging of exploration over easy assertion was also at play in several fest films concerned with American communities and cultures. In Uncertain, which screened as a work in progress, a town on the Texas-Louisiana border honestly named Uncertain, TX serves as less of an excuse for southern gothic portraiture (though there are moments of this, especially a non sequitur involving a pet raccoon that I'm hoping will be excised for the final cut) than an expansive inquiry into how environment makes a people, people transform an environment, and of how both are desperately in need of second chances. Also in search of real and illusory second chances are the subjects of The Overnighters, which took home a special prize at Sundance (and which I've written about elsewhere) for its story of a pastor in a North Dakota boomtown who faces waves of resistance for harboring transplanted workers on the grounds of his Lutheran church. The quandaries at the heart of Jesse Moss's intimate, empathetic, and nuanced feat of immersive filmmaking are as old as the Union itself, and have only gotten more irresolvable with time. Where does collective responsibility end and individual sovereignty begin? What price community? What price lack of community? 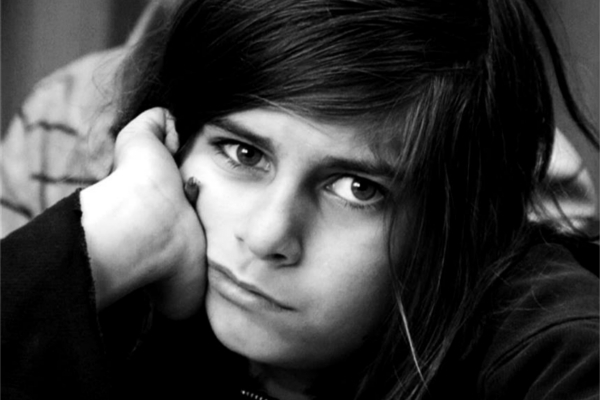 Whose responsibility are the poor, the homeless, the itinerant, the struggling and recovering? And do we truly believe in forgiveness and redemption, or are these just notions reserved for our self-delusional fictions? Moss's film may be cannily constructed, but what he captures is far too messy and unpredictable to be derived from anything but indefatigably observed reality. Set in Texas, like Uncertain, and similarly captured by a non-American filmmaker, Killing Time is a stealthy, 55-minute gut punch about the banality of capital punishment. The film is split into two parts: the first, "The Crime" which presents testimonies from witnesses, victims, and the family of a man convicted of two rapes and a murder in the mid-1990s; and "Punishment," which cuts between the humdrum scene outside of the execution site, where a stage is constructed and beat reporters await an eventual press conference, and a nearby home that's rented out routinely to relatives of the damned, who, as African-Americans abutting the system, seem all too aware of the inevitability, and perverse normality, of it all. A sense of inevitability also haunts Demonstration, an experiment in documentary crowdsourcing from Russian maestro Victor Kossakovsky. Shot with the help of 32 Spanish film students, the film records the events of a single-day general strike in central Barcelona, from the calm-before-the-storm entreaties of an elderly protestor in the town square to the ensuing parade of Guy Fawkes-masked youngsters, who decorate retail establishments with graffiti and overturn garbage bins to block traffic and fend off the police. While much of the footage is thrilling, terrifying, and oddly beautiful (particularly a static shot of crowds ebbing and flowing in front of a Burger King's reflective façade), some of it places the drama within the context of a still-functioning larger city, records moments when there are more recorders of the event than participants, and observes the nonplussed next-day recovery, in which the city is rather easily restored to its previous mood and appearance. Kossakovksy's archest touch is to score all of this to Léon Minkus's Don Quixote ballet, which was being performed in Barcelona that night, subjecting all movement, heroic and otherwise, to a finite, repeatable, and timeless composition. It both heroicizes and diminishes the action, which, if you allow yourself to get on the film's wavelength, seems just. Other films in the festival are just as worthy of discussion, such as Mati Diop's stunningly low-fi hybrid A Thousand Suns (Mille soleils); the exhilaratingly idiosyncratic Nick Cave memoir/reverie/deadpan comedy/studio recording document 20,000 Days on Earth (about which much was said at Sundance and will be said at the upcoming New Directors/New Films); and the charmingly stuffy Joycean Society, in which a cameraman gamely crams into a small library in Zurich to document a meeting of a Finnegans Wake reading group, which is equal parts delightful and enervating, and thus exactly as it ought to be. By contrast I didn't care much for Concerning Violence, which marred phenomenal archival footage of with quotations from Frantz Fanon's The Wretched of the Earth that are simultaneously narrated (distractingly so) by Lauryn Hill and ceaselessly and pedantically placarded across the screen, lest any of us, at any time, miss the import and message. And outside of some very entertaining bits involving supporting characters-particularly a knowingly bloated Bill Clinton lookalike flipping through cable TV in a dingy motel in nowheresville, America-Bronx Obama, which tells the story of Barack dead-ringer Louis Ortiz, is the kind of perfectly fine but thoroughly unremarkable underdog doc that pads out larger fests but is pretty unnecessary at a cream-of-the-crop survey like True/False. The last film of the documentary festival wasn't a documentary at all. 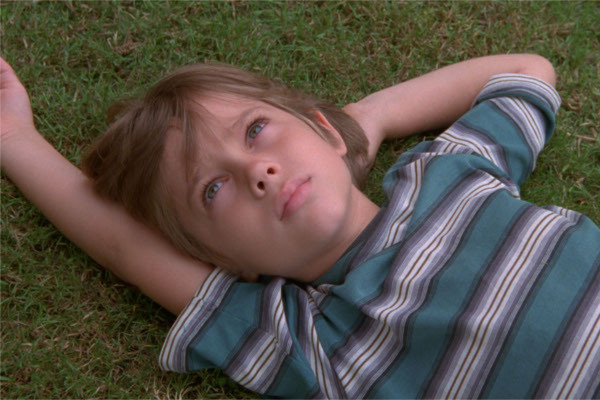 Yet in its formal experimentation, its shape-of-its-own singularity, and in its searching, its questioning, its stubborn refusal to be what you might expect it to be, Richard Linklater's Boyhood fit in perfectly. Who knows what mainstream audiences will make of a twelve-years-in-the-making film that grows up alongside its characters, changing style and composition and tone and acting proficiency as it goes. Who knows if they'll be as moved as I was, or as appreciative of the fact that I never felt what I thought I was going to feel, or felt it when I thought I would feel it, and thus felt all of it more deeply and sincerely than I ever would have otherwise. But the spectrum of people in the 1700 seat Jesse Auditorium, seemed to be. It's a work of fiction, but the reason that those 1700 leapt to their feet at the sight of young actor Ellar Coltrane on stage after the screening was because of his actuality, because though he was playing a character, we really did watch him do something as common and remarkable as grow up. Twelve years in 164 minutes. Reality and illusion. Recording and construction. Time reflected and made. Here, at least-thanks to this culture that True/False has fostered over these years, and that I'd like to think reflects what's always been out there and can continue to grow-an audience can exult in the messes of ambition, of experimentation, of questioning, can be willing to go with it, and reap the deep rewards that they afford.